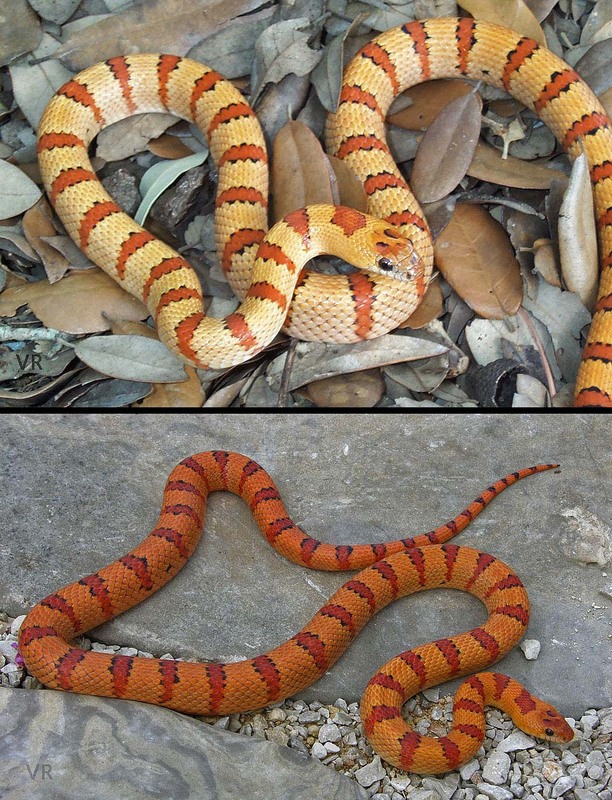 The two photos above are of the same snake. The top photo taken as a hatchling and the bottom photo taken as an adult. The VR Strain Variable Kingsnakes that are light toned as juveniles tend to develop deeper, more saturated colors as adults. The VR Strains that are color saturated and darker toned as juveniles are more likely to remain more or less the same as they mature into the adult form. The photo of the juvenile was taken in 1995 and the photo of the adult was taken in 2013. This animal is still alive today, looks virtually the same and is an avid breeder when given the opportunity. This snake was the first official representative of the VR strains - Variable Kingsnakes that produce bright, saturated colors in a reproducible fashion. At the time that the VR Strains were introduced to the hobbyist market there were no other colubrids quite like them. In addition to clear, brilliant colors, many VR strain examples feature extremely reduced black banding.